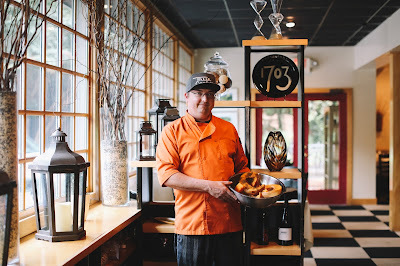 Whether he’s walking the woods of Winston-Salem with his daughter searching for in-season mushrooms or he’s planning another deliciously successful Beer v. Wine 2nd Sunday Supper, Curtis Hackaday, head chef at 1703 Restaurant and Catering, is constantly chasing his curiosity for bringing the unexpected to your plate. On the first day of autumn he was present in the kitchen and preparing for the 1703 lunch rush with spices meticulously lined up on the counter and pans preheating for sauces and fresh ingredients. He briskly and effortlessly moved around the shelves of supplies and implements surrounding him. 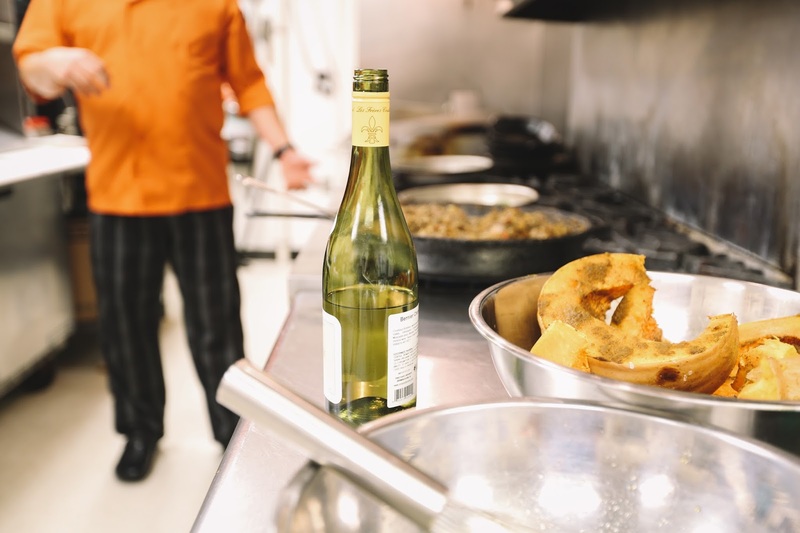 As he stirred an enormous pan of sautéed greens and seasoned a bowl of pumpkin to make a fall infused curry he enthusiastically answered our questions about how he grew a passion into an admirable career as one of Winston-Salem’s finest. Hackaday started at 1703 not soon after the restaurant opened its doors in 2000 but he didn’t start in the kitchen. Instead, he and his sister were servers for several years. He jumped in head first doing whatever it took to get into the kitchen and in 2012 his do-what-it-takes attitude paid off. 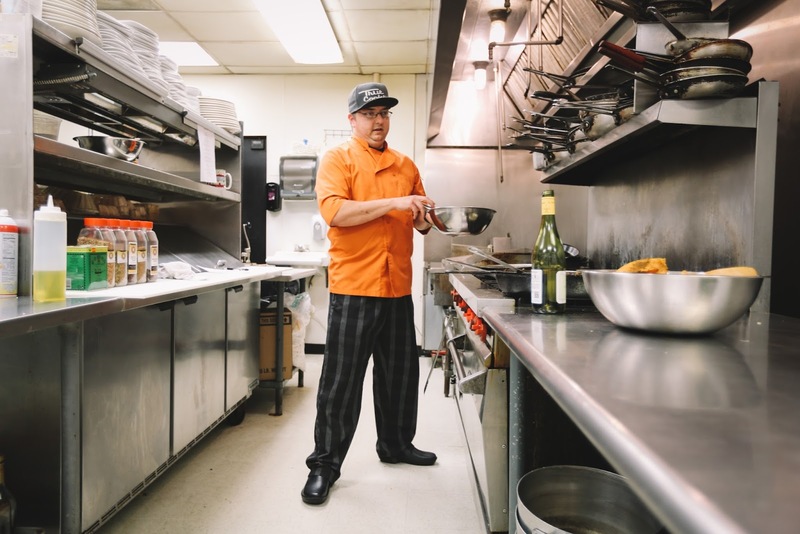 He was given full reign to create what is arguably the Triad’s most imaginative and daily evolving menu. While he is now praised for his unique spin Hackaday says it wasn’t always easy welcoming guests into the cutting edge of culinary innovation. 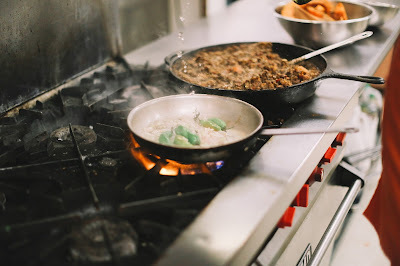 His love for international influence is clear and he finds inspiration in authentic dishes both from afar and those we’ve always known and loved, always putting his original spin on them. 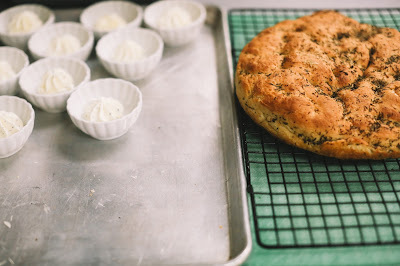 His desire to explore new ingredients and new methods of preparation doesn’t just end with blending cuisines. He also has a passion for adapting for what people want and what people need. 1703 not only takes this approach with their daily menu they also invite clients to collaborate on the catering side of their business. In the two events, Hackaday is catering in the upcoming week he keeps it close to the classics for one client while roasting a whole pig and grilling an octopus for the other. It is clear Hackaday is willing to deliver on what guests want, so what about what guests need? No matter the cooking challenge, Hackaday seems ready to take it on. 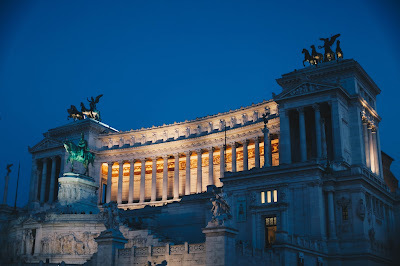 What may be considered the most challenging season for 1703 is certainly the month of December when they host office Christmas parties, their regulars, and catering all in the same day. So what tools does Hackaday use to survive the most wonderful time of the year? Some other things he can’t live without are good knives and good shoes. He motions to the new Alegria Men’s Schuster Black Tumbles he was fitted for before he began prepping lunch and talking with us. With all the energy and movement it takes to create the inspired menu found at 1703 the last thing he needs on his mind are aching feet. After a promise to visit for brunch, we took our leave from the hidden gem on Robinhood Road far from buzzy downtown eateries but right at the heart of what’s fresh and exciting on the Winston-Salem restaurant scene. We can’t wait to see what Chef Curtis Hackaday has in mind for putting his signature spin on next. 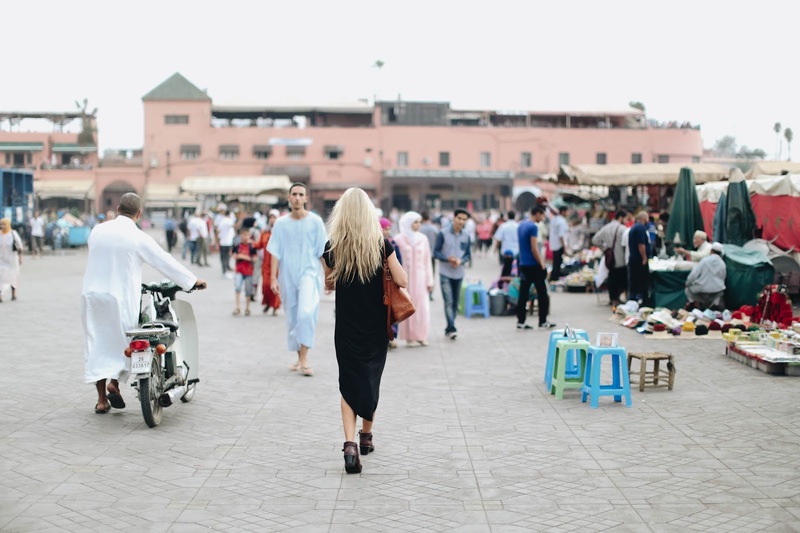 To finish off our amazing trip to Morocco, we left the red city of Marrakech and headed up north. After seven hours in a train we felt very familiar with the Moroccan countryside, but fortunately, train travel in Morocco is fast and comfortable. We arrived at Dar Roumana in Fes just in time for dinner, which was good because we chose to stay there after hearing about the famous French chef that ran the Dar. The space was gorgeous, and the rooms were comfortable but that night all we cared about was the dinner, and it lived up to its reputation. After a week of eating Moroccan tagine, meals cooked in a clay pot, the wild rice and sautéed fish were an incredibly welcome change. 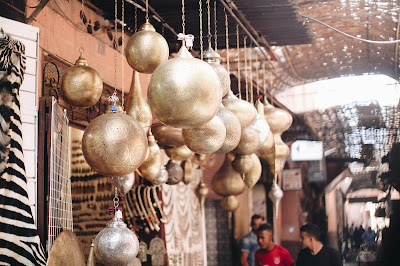 The following day in Fes we explored markets and tanneries with beautifully kind human beings. We met some of the most generous and loving people of the whole trip in Fes, and it was a nice change from the constant hustling of Marrakech. Sweet locals led us through the incredible maze of the medina where more random people helped, happy to point us in the right direction when we got hopelessly lost. 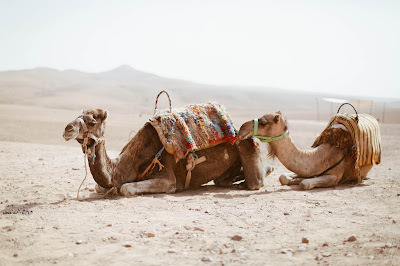 We stopped for lunch at Cafe Clock where we got to sample a camel burger as well as some more local dishes, and then we headed off to the tannery. 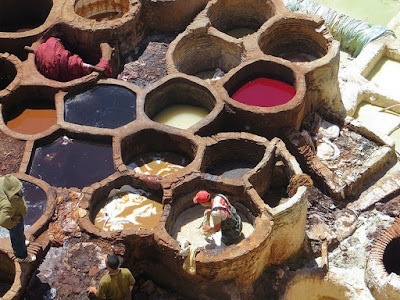 The Fes tanneries are famous since Fes is the handicraft capital of Morocco. When we showed up, they gave us a large handful of mint leaves or Berbere gas masks as the locals called it, which proved very necessary because the smell was unbelievably disgusting. Stink aside it was worth it. 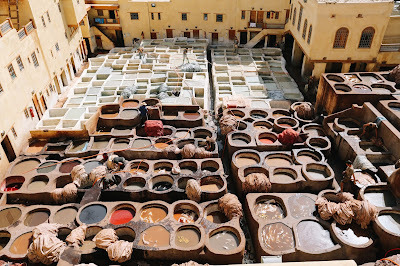 The view of the famous tanneries was everything for which we hoped. From the tanneries, we spent the rest of the day exploring the gorgeous architecture and the beautiful little local markets until it was time to head back to the amazing Dar Roumana for another delicious dinner. The next morning, we woke up early and headed to the bus station, off to our next destination. Four very, very bumpy hours later, we were high in the Atlas Mountains in the little city of Chefchouan, also known as the Blue City, and they aren't joking. 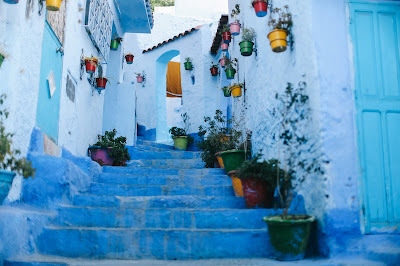 Inside the walls of the medina, everything is a gorgeous powder blue and sometimes varying shades often with darker blue doors. It's one of the most peaceful places in the world, calm, quiet, and relaxed. We stopped in the main square for a glass of mint tea and a Moroccan tagine before taking an extended walking tour of the stunning city. We ended our day on the rooftop of a small local restaurant to watch the golden sun set over the soft blue of the city. It was a perfect day. The next day, we packed up and hopped on the bus to head back to Fes, and to prepare for our trek back to Marrakech to Barcelona and then back home to the States. All in all it was a perfect trip and we're already ready for our next adventure. 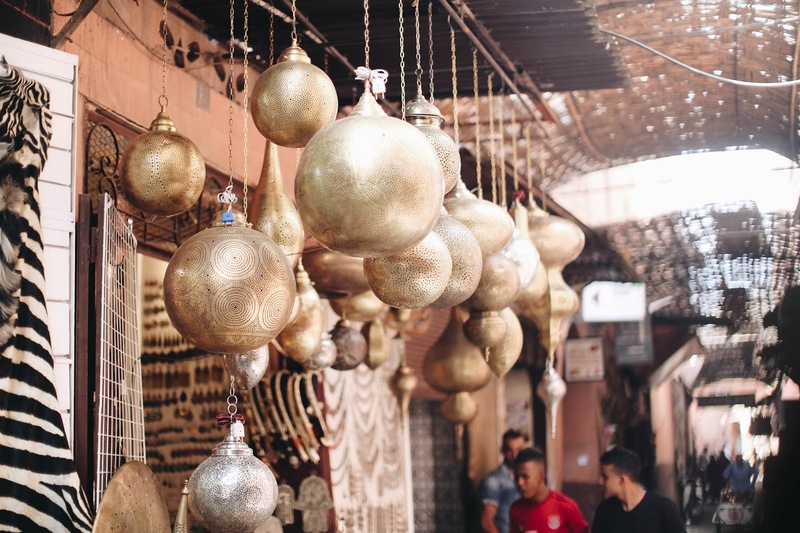 Le Riad Berbere is a hidden gem tucked away in the heart of Marrakesh’s bustling medina and is the main reason we booked this trip. 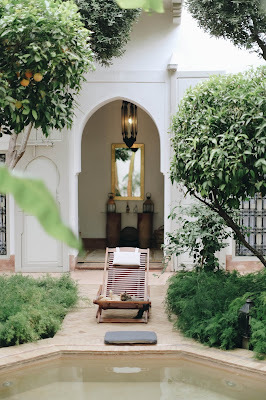 The courtyard bloomed with banana, orange, and olive trees and cast dappled shade on plush pillows where the riad’s resident feline occasionally joined us and taught us a thing or two about relaxation. On the terraces, we sunbathed and sampled delicious, fragrant foods prepared organically with groceries purchased daily from local markets and wholesalers. We were even offered the opportunity to learn how to cook authentic Moroccan dishes by the chef. We opted to leave the cuisine up to the master and instead took a taxi to Jardin Majorelle. After leaving the garden, we dropped in for lunch at a fantastic little restaurant in the middle of the medina called La Famille. Slightly tricky to find we spotted the number 42 marking the doorway entrance off a very busy and crowded pedestrian street around the corner from the Museum of Moroccan Art, Dar Si Said Museum. 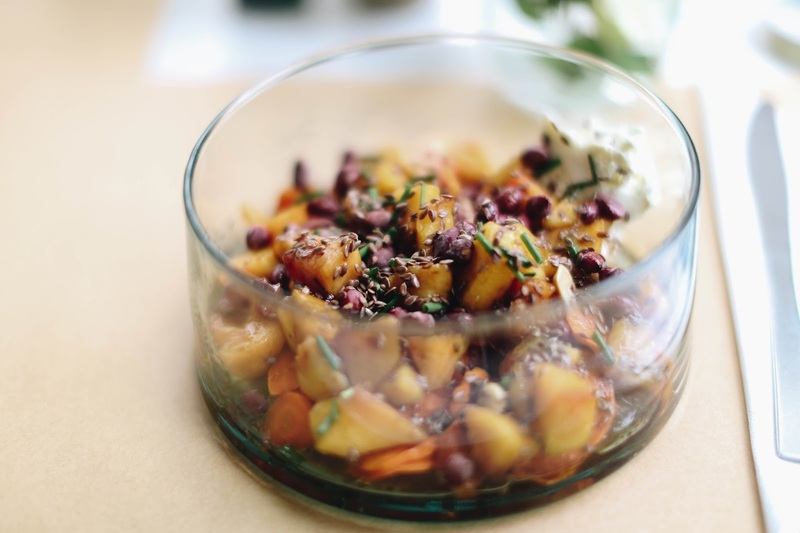 Their menu changes daily and is a meat-free, Moroccan-Mediterranean fusion. 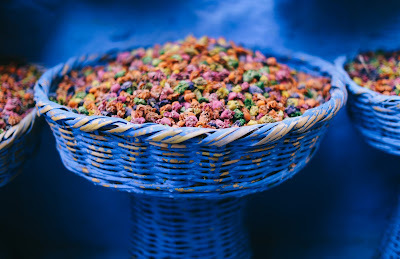 This type of Marrakesh dining makes this vegan photographer euphoric. The sun set on another exciting day in the Red City as we prepared to depart the next day. 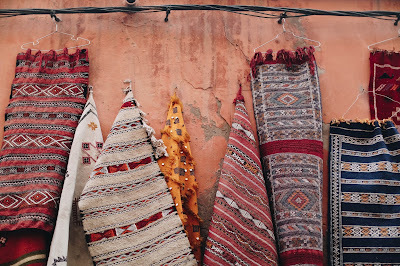 On our last day in Marrakesh, we decided to spend the afternoon wandering the beautiful streets, stopping in at our favorite shops, and of course, spending time at our beautiful riad. For the long day of walking and shopping, I decided to don my favorite brown leather Caiti boots, because they're incredibly comfortable and resistant to the water and puddles of the Marrakesh streets. We stopped in for one last lunch at Nomad right off the spice market square, and I had a delicious lentil salad with fresh goat cheese. After walking the miles of the medina and saying goodbye to our favorites, we went back to the riad to dip our feet in the pool and change for dinner. I chose my trusty Indi Oxblood Bloom boots to pair with my black Joah Brown dress for a beautiful night out on the town. Marrakesh, it's been fun. Now we're heading north! Stay tuned for more from the blue city of Chefchouan, and the busy medina of Fes. After leaving the desert, we checked into Beldi Country Club, a stunning garden hotel just outside of the city. Locals use it as a public pool and spa and then tucked away in another part of the gardens is an Eco-luxury hotel. 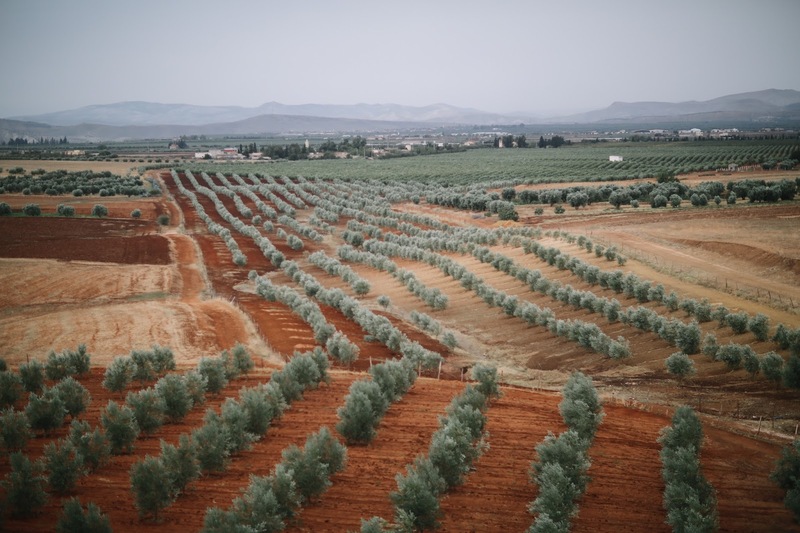 With an outdoor space overlooking the Atlas Mountains and gardens of olive trees, palms, and roses in every color this sustainable hotel was constructed with local and traditional materials by local artisans to make the space as gorgeous as it is authentic. Being at Beldi was an exercise in practicing self-love. 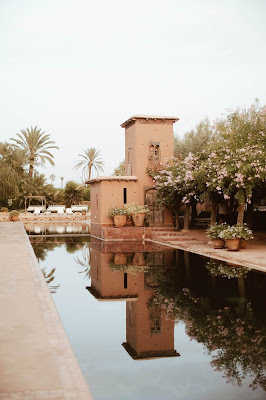 We were far enough from the city that it didn't make sense to leave and go to the medina, center of town, so I spent most of my days there wandering around the beautiful gardens, laying by the pool, or spending 3 hours at a time in the spa. It was here that I tried my first Moroccan hammam, which I'd been hearing about for years. A hammam is the steam bath relative of a sauna. At first, I didn't know what to expect, but the experience left me pleasantly surprised. A woman led into a heated humid room covered in fresh flowers and herbs, and she doused me in steaming hot water from head to foot. After that, I was instructed to lay on a warm stone slab surrounded by herbs and soak in the steam. Once I was sufficiently soaked, she came back with Moroccan black soap and a rough glove, scrubbed my entire body, and got rid of dead skin that I may have had for centuries to come. I felt like I was glowing when I walked out. From there I was lead straight into the massage room and had all my dead skin replaced with beautifully fresh essential oils as well as one of the best massages of my life. After that came the facial but by then I swear I was floating five feet off the ground, so I don't remember much of that. Somehow I found my way from the spa through gardens filled with roses and thyme and managed to collapse my way into the bubble bath in my room where I had to pinch myself a few times to make sure I wasn't dreaming. 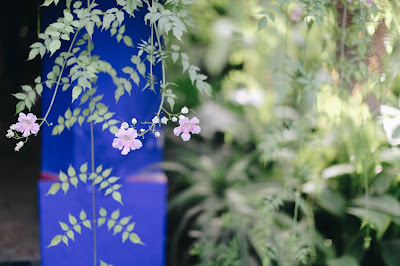 Breakfast, lunch, and dinner were all served in a beautiful outdoor dining room completely covered in gorgeous flowers. At night, the beautiful Moroccan lamps glowed under the flower canopy, and it looked like something straight out of a fairytale. 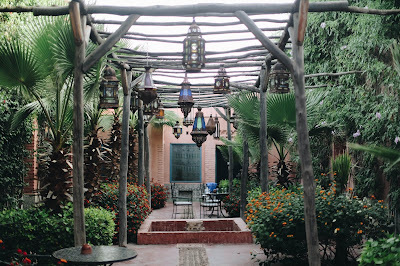 We left the Beldi oasis to check into blue and white walled paradise of Le Riad Yasmine in the medina, or old city. Gorgeous pool with a beautiful layout and a lovely French woman who ran the whole thing. As tempted as we were to spend the entire day lounging by the pool it was our first opportunity to experience the medina, so we took advantage of that. What an opportunity it was! I think I bought the entire medina. Poufs, Moroccan rugs, at least five pairs of shoes, because you can’t ever have enough shoes, gorgeous wool scarves, and fragrant teas. Oh, and leather bags. Because we've entered leather heaven. But, in between all the buying, the experience was a little hectic. 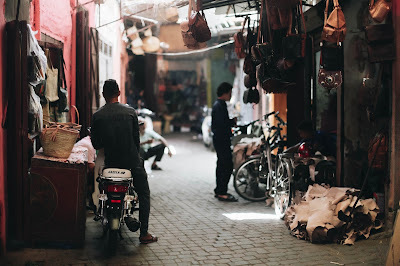 The souks, shops, in the medina are set up in a small, crowded labyrinth, and it quickly becomes a muddled mess of confused tourists, yelling street vendors, and motorbikes swerving everywhere. It took me a few days to get the swing of all the chaos, but once you learn to appreciate it for its insanity, the experience is less overwhelming. 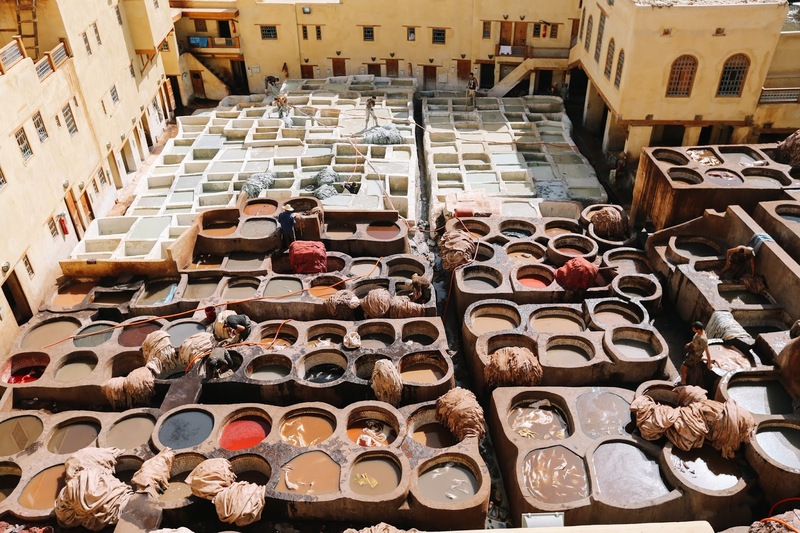 We toured the tanneries to see how the leather here is made and found out that it’s soaked in pigeon poop. We talked to amazing makers who truly find their life's purpose in what they're creating and we smelled every spice that has ever existed. After our night at Riad Yasmine, we checked into Riad Berbere, which is pretty much the reason I booked this whole trip. I'd seen photos and decided that this place was a heavenly oasis from the world. I couldn't have been more right. Since this riad, house with a central garden and courtyard, is truly in the heart of the medina the taxis couldn't take us all the way to it. After a super bumpy taxi ride, we hopped out and immediately had all our luggage picked up by a Moroccan man with a cart. He unceremoniously shoved my camera bag right up front where it looked perilously close to tipping and in danger of being run over by millions of motorbikes. I was running to keep up with him still not totally sure what was going on. He led us down a series of small corridors, and we finally ended up at Riad Berbere. 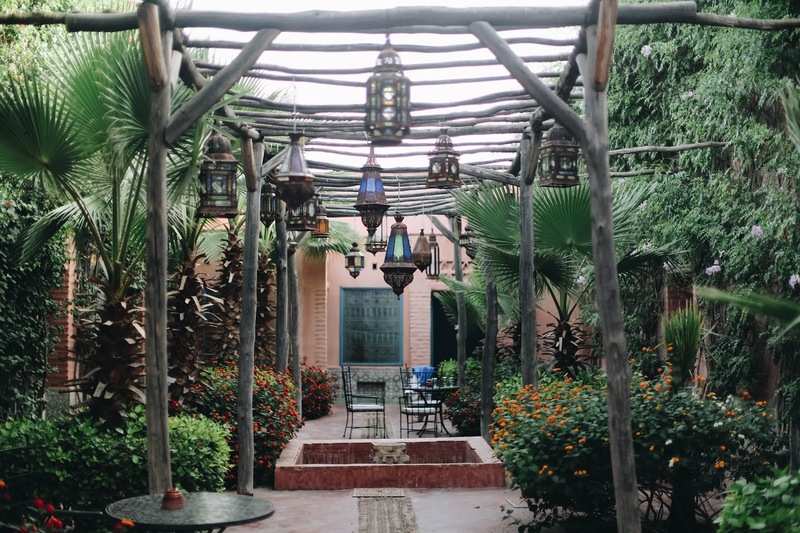 I cried when they opened the door - the entire place smelled like roses and in the middle of the Riad there's a beautiful little pool surrounded by massive banana trees and other lush greenery. It's the best oasis the medina could ever have and completely counterbalances the craziness of the red city. 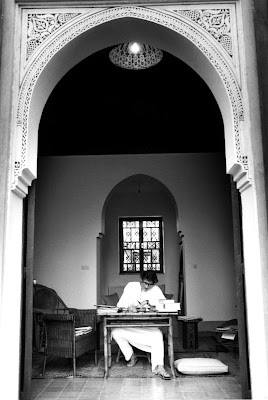 More to come from Riad Berbere in my next post. 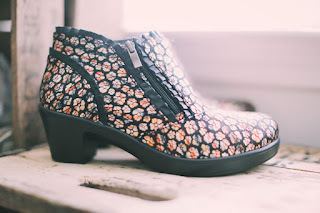 As cute as they are spooky the Debra Sugar Skulls was our best selling shoe of Fall 2015. 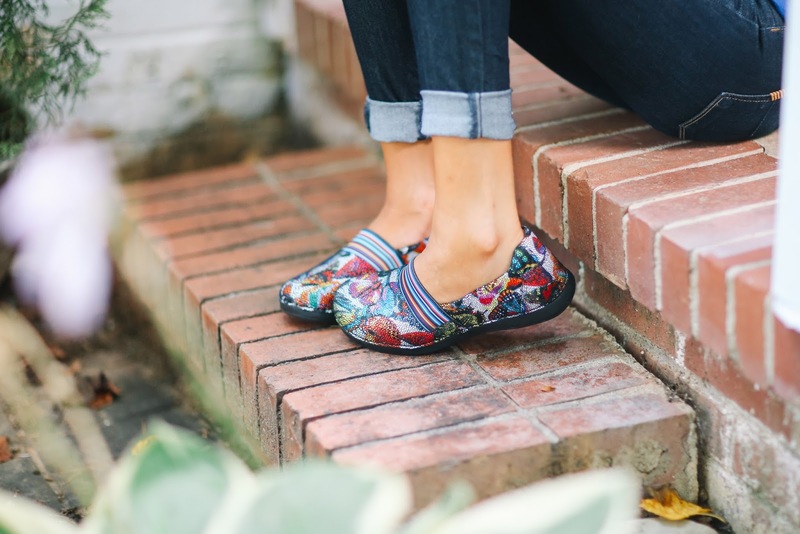 Bright colors, playful accents, and toothy grins adorn the loafer in a way that reminds us of October’s fall harvest festivities. Sugar skulls are all over the place in Western culture adorning everything from rolling pins to bracelets to area rugs to S’well water bottles. As you slip into your Sockwells and don your Debras in Fall 2016, we invite you to reflect on the origins of this seasonal skull. Skeletons are an iconic part of Dia de los Muertos, a Mexican celebration of the Day of the Dead. The three-day long fiesta begins on October 31st and ending on November 2nd. On these days, people believe that honoring late friends, family, and neighbors will bring future happiness to the living the following year. In preparation for this homecoming, the families craft altars in their homes and cemeteries decorating them with the favorite foods, drinks, and gifts of the dearly departed. People place sugar skulls on the altars along with marigolds and pan de muerto. One of the most famous of the skeletal characters to make an appearance for the festivities is La Catrina. The creation of Antonio Vanegas Arroyo, she is an elegantly dressed figure wearing a French-inspired hat. Intended to make a political statement in pre-Revolutionary Mexico she represents wealth and serves as a reminder that death is the one true equalizer between classes. The calaveritas de azucar are a combination of sugar, water, and meringue powder you press into a skull mold. Decorated with bright icings, marigolds, foil, and even the name of the deceased these skulls are meant to be colorful- a representation and celebration of the living. Mexicans see this vibrant pigment as a sweet reminder of the inevitability of the afterlife. In contrast to Halloween, when people fear and evade death at all costs, Dia de los Muertos is intended to be a celebration and the Mexican attitude toward death itself is reflected in the playful and celebratory papier mache parades that flood the streets of Mexico City. Attendees paint their faces to joyfully dance on the line between life and death before heading to late night candle light vigils in cemeteries. How can you get in the mood for this celebration of all things Day of the Dead? Your favorite Alegrias are a good start, but we want to sweeten the deal with a gift with purchase to keep your feet comfy and warm while you attend your favorite autumn festivities. That’s right! You heard us! We’ve partnered with Sockwell to give away a free pair with every purchase of a Debra Sugar Skull or Keli PRO Sugar Skull Dottie between now and October 31st. What’s so special about these socks? Made with a merino wool and bamboo blend these socks are meant to be high-performance compression socks while also being visually attractive and physically comfortable. The designers kept the wearer’s needs in mind and incorporated two levels of graduated compression. Better yet these socks are all-American in both the materials and mills used in production. 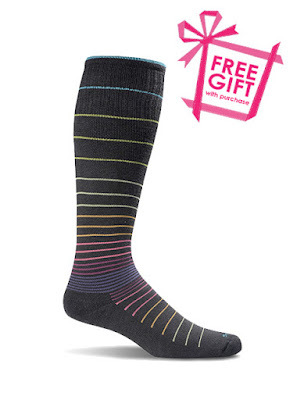 Sockwell Circulator Compression Socks in Black Stripe - Free Gift With Purchase! Even if you already have your Alegria Sugar Skull shoes, you’ll want to pick up a pair of Sockwell socks for the perfect match in comfort and style. Hit the leaf-covered streets this October in the most popular pattern of the season with the best socks you’ve ever worn, and you’ll be ready for whatever tricks and treats come your way. Happy Harvest! Put down your glass of rosé and pick up a pumpkin spiced treat, fall is here! You know what that means. Time to break out the layers of scarves, knit sweaters, and tights. As you change your nail polish from Essie Pink Parka to OPI Malaga Wine don’t forget to transition the rest of your style too! We did the work for you to pull together the need-to-know notes so you can enter Fall 2016 just as fiercely as you’re leaving behind Summer 2016. One can hardly talk about style without mentioning one of the biggest game changing events in the industry’s calendar-New York Fashion Week. Bold florals are here to prove spring time isn’t the only season for flower petals and palm fronds with Tory Burch’s line of dresses and shirts. The boom of blooms on black reminds us of our own Winter Garden colorway boldly displayed on the classic Paloma and many other shoes this season. The butterfly embellishment is in full effect and Valentino’s trench combines the established trend of military inspired outerwear with this surprising pop of color and whimsy. Just as surprising a pop of whimsy can be seen on a Facebook favorite our ours- the Glee slide-in. Two of Fall 2016’s bigger inspirations at NYFW include the military inspired pieces with a specific nod to the nautical branch and athletic wear paying homage to the street style of the 90s. Before you don your double-breasted coat in everyone’s favorite navy blue hue be sure to pick up a pair of your own standard issue Izzy boots to get in formation with this trend. Looking for something a little lower profile but still highly functional for your sportier side? The Essence in Posh Pewter adds a shine to your shoe collection while being on point with designers obsessing over all that glitters. Speaking of color- this fall highlights elements of warmth, shine, and gloss. You’ll be seeing plenty of red, rust, mustard yellow, and oranges in rich tones paired with gold and bronze metallics and high gloss varnishes. Now that you have the outline of what to look for in your new fall favorites don’t ignore what you already have in your closet as you take your fashion from the cabana at Miami Beach to the orchard in Martha’s Vineyard. Be sure to layer in your cozy new pieces with ones you already have on hand. A red dress paired with a black blazer makes a warm weather favorite go a little further. A pair of booties matched with a leg baring pair of leather shorts is an encouraged blend of the seasons. Likewise, wearing sandals with layered outfits- don’t forget your “rule of three”- is another way to make the move towards cool autumn evenings. We have one sandal that is the perfect combo of Fall 2016’s deep yellow and bright metallic finishes. Not quite into toe-bearing fashion as you approach October? Transition a little more gently with this crossover sandal in a red hue that is seen much on recent runways as it is on the turning leaves. Just remember, ladies- no matter how you transition your summer footwear leave the white cotton socks out of it. Booties, leather accessories, scarves, and chunky knit sweaters all evoke Saturday afternoon hay rides and tailgating. So take a deep breath of crisp air and raise your tea latte to the official arrival of autumn weather and fall fashion. One of the many exciting annual events at Winston-Salem Fairgrounds…. 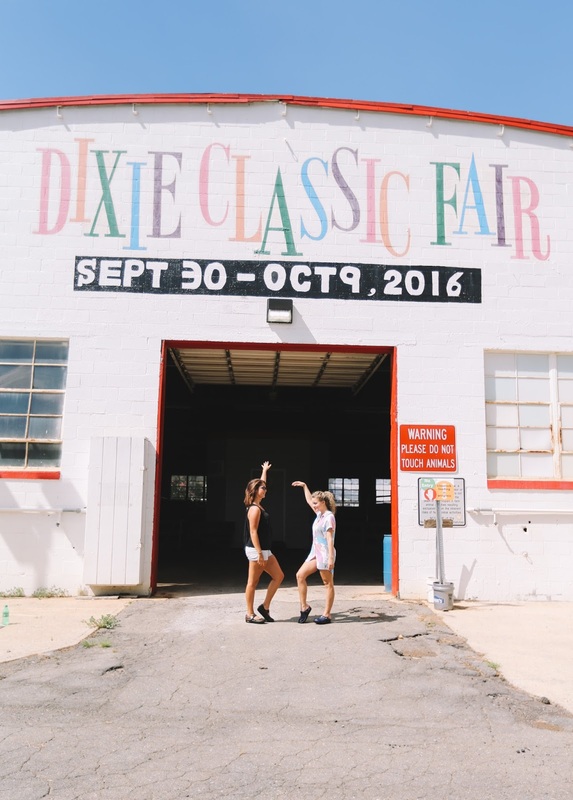 The Dixie Classic Fair is all fun and games…that is, until you’ve walked all over the fairgrounds 5 times and your small children want to walk through the rides and games a few more times! Your feet are in excruciating pain and now your children are pulling at you to keep up. Your friends are begging you to “just make it to the next ride!” Oh my gosh, you feel like you’re walking in high heels and your feet are going to fall off and your legs are going to break if you take one more step! You try to put weight on one foot at a time or dig your toes down to take the pressure off your burning heels. Well, that’s only a temporary fix. Instead of thinking about where the next bench is or when your next break will be, you should be enjoying yourself, the company you keep, and the many thrilling events and rides the fair has to offer. That’s what the Dixie Classic Fair is all about!!! 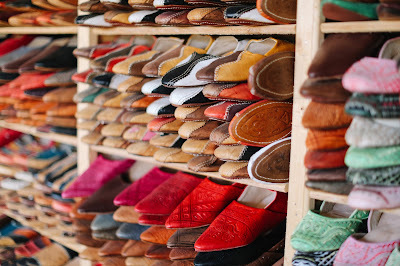 If you’re looking to be able to take in all the sights, walk for hours while maintaining constant comfort, look no further than Alegria Shoe Shop! 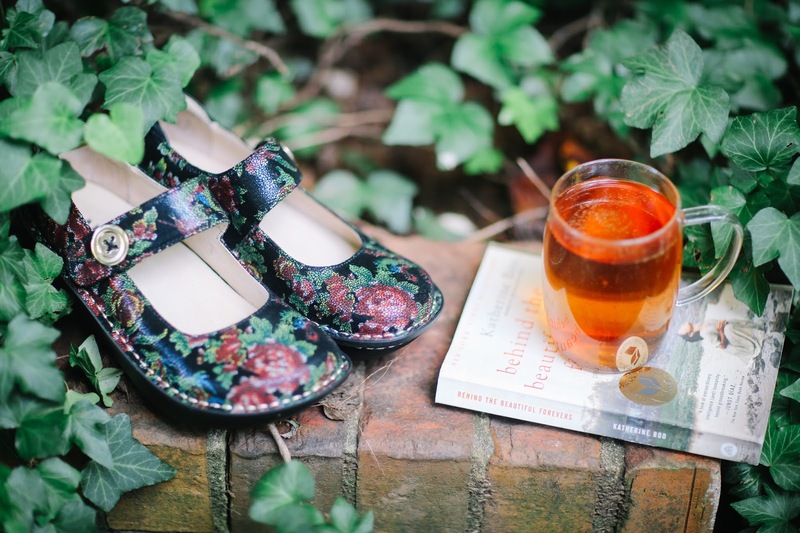 Based locally out of Winston-Salem, a hop, skip and a jump down from the Winston-Salem Fairgrounds, Alegria Shoe Shop is the World’s #1 Distributor of THE most popular comfort brand, Alegria Shoes! Alegria Shoes were developed to provide unparalleled comfort, and maximum support to its customers without compromising style. 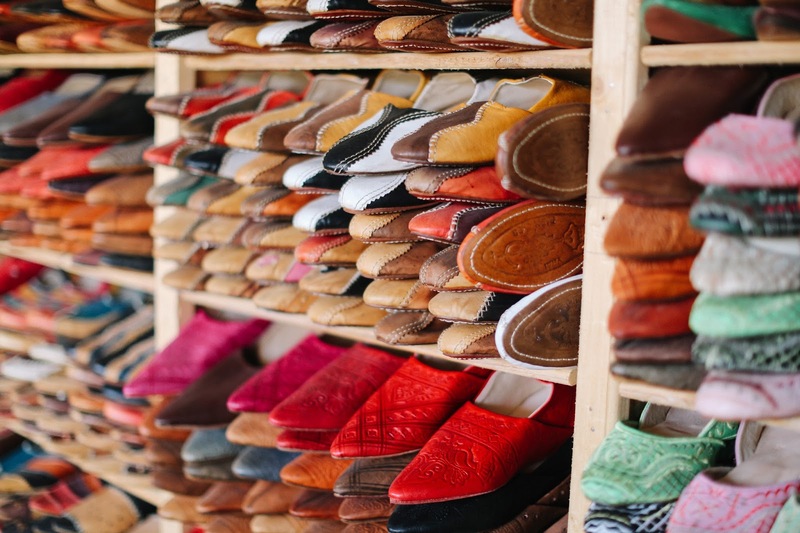 Whether you want to rock a pair of mules, boots, sandals, or even an athletic shoe, you can find a style and color to match your personality and lifestyle. Most unique feature is their removable and replaceable insole that forms to the natural contours of your feet. You’ll always feel like you’re wearing a new pair of shoes! Our signature footbeds are made up of memory foam, cork, and latex for a cloud like feel. 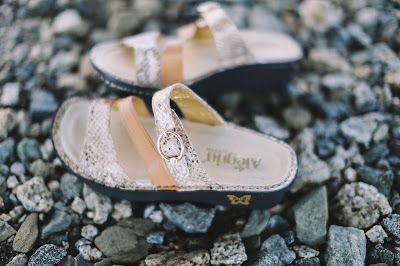 Alegria Shoes are definitely the shoes of choice to wear when trekking around the fairgrounds. The rocker bottom ensures proper heel to toe walking motion and relieves lower back pain and knee pain! The only thought on your mind will be, “Where can we walk next!” Taking a spin on one of the fair rides? Lace up the popular Essence sneaker to be sure you won’t lose a shoe while zipping around and upside down on one of the fair’s many rides! Don’t forget the Barnyard Zoo! Keeping your shoes nice and clean is easy with Alegria’s easy to clean shoes! Our Professional Line is slip resistant, stain resistant, and some are even water resistant so no worries about getting them dirty while visiting your favorite animals. 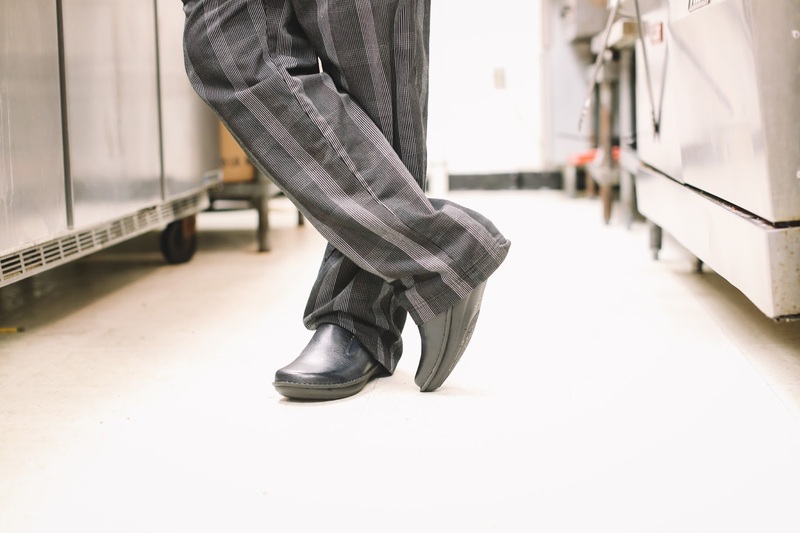 Alegria Shoes are versatile, so whether you’re at the fair, out on the town, or at work for a long 12-hour shift, you are sure to find a shoe to get you through the day both in comfort and style. Shop our wide selection of hundreds of colors, styles and sizes you can enjoy at The Dixie Classic Fair, and really, any event you’re going to! We assure you comfort mixed with a fashion forward look you can pair with all attire. 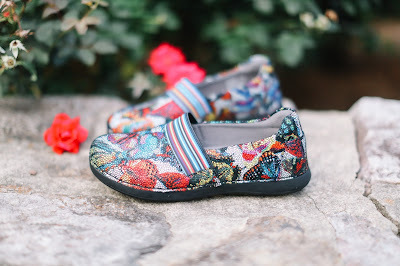 We feel confident Alegria will be your daily go to shoe! Now get out there in your Alegria Shoes and enjoy your ride on the Himalaya! Just wait to eat until after! When you're on your feet all day or night, your soles aren't the only thing that can hurt at the end of your shift. Calves, knees, and even your back can suffer if you don't have the support you need while you work. You might think about orthopedic shoes but can't force yourself to buy those ugly white "nurse" shoes just to feel better. You don't have to crimp your style anymore because we've got your look, and your back. See how feeling good can look great with Alegria Shoes. What Happens When Your Shoes Aren't Supportive? The simple solution to all of these problems is to wear supportive shoes. What Makes a Shoe Supportive? Orthopedic shoes help you avoid all of the risks associated with standing on your feet all day. But many people think they have to sacrifice fashion for comfort. It's true that the mention of orthopedic shoes brings to mind those ugly white shoes that nurses used to wear. But Alegria has combined all the health benefits of orthopedic shoes with the latest styles and colors, so you can look and feel your best. 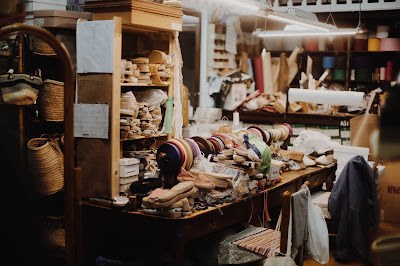 With an insole comprised of cork, memory foam, and latex, these shoes conform to your feet and keep you comfortable, absorbing impact without added weight. 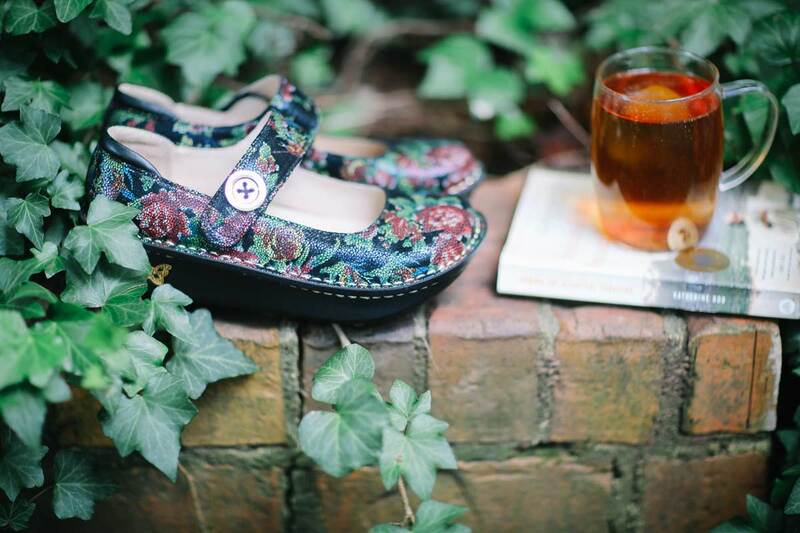 If you like the look of a classic clog, the Alegria Clog offers a variety of textures, colors, and prints. A few of the choices you'll find in this style are suede, tooled leather, and patent leather. If you prefer a Mary Jane, the Alegria Paloma gives you additional support behind the heel and a rocking sole that supports your every step. Colorful prints to coordinate with your mood include mustaches, flowers, mandalas, feathers, buttons, and even a whimsical chain mail print. Another favorite is the Alegria Keli. 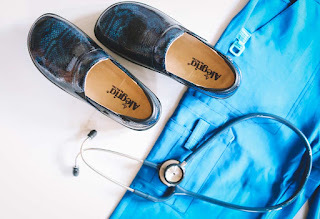 This professional nursing shoe gives you ultimate slip-on comfort with plenty of style. Crocodile, snake scale, and imprinted leather are a few of the fashionable textures to complete your outfit. Add a pop of color with prints in puzzle pieces for Autism awareness, intergalactic stars, girlfriends on the phone, plaids, and flowers. So, where can you get these pretty, yet powerful, shoes? 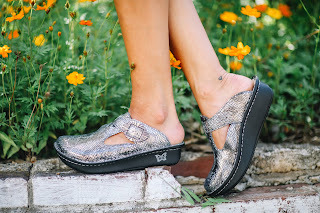 Visit us at www.alegriashoeshop.com -- that's where to buy all the latest styles and colors to keep your back strong and your feet comfy. Alegria is harvesting the new Fall 2016 Collection and it’s coming in HOT! Red hot actually! 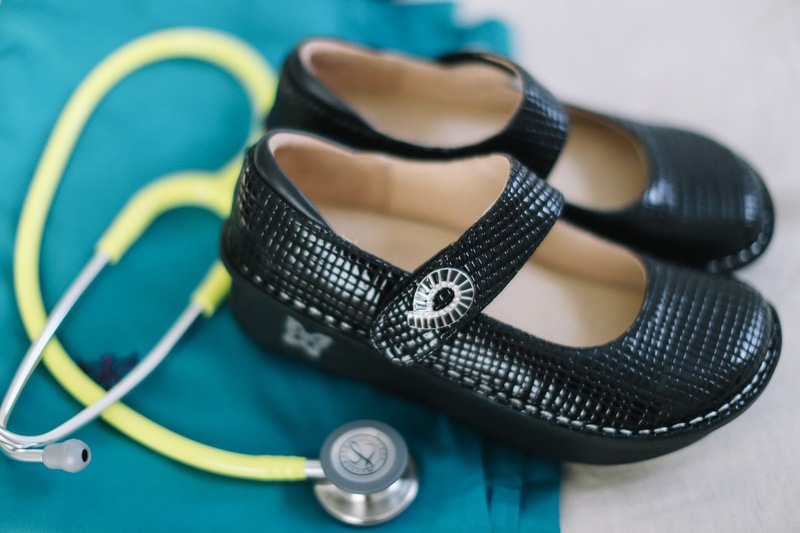 Although the Debra Professional shoe was designed for those in healthcare, we've long known that ANYBODY can enjoy the style and comfort of this amazing shoe! The Alegria Debra I Heart U Red will be a game changer for your wardrobe this fall. 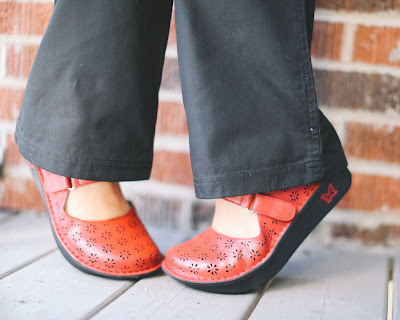 For those of us wearing scrubs, I Heart U Red will certainly turn heads on the hospital floor this season. Wearing these Debras outside of work is just as easy with casual denim capris or distressed skinny jeans for kicking it downtown for a wine down Wednesday atmosphere. UNIQUE COLOR: The soft, distressed red leather upper has an enchanting embossed heart pattern that will stand out, without STANDING OUT. So you can pair them with a striped sweater or colored denim and not look like you just got dressed in the dark. This print is fun and easy and far from overwhelming. 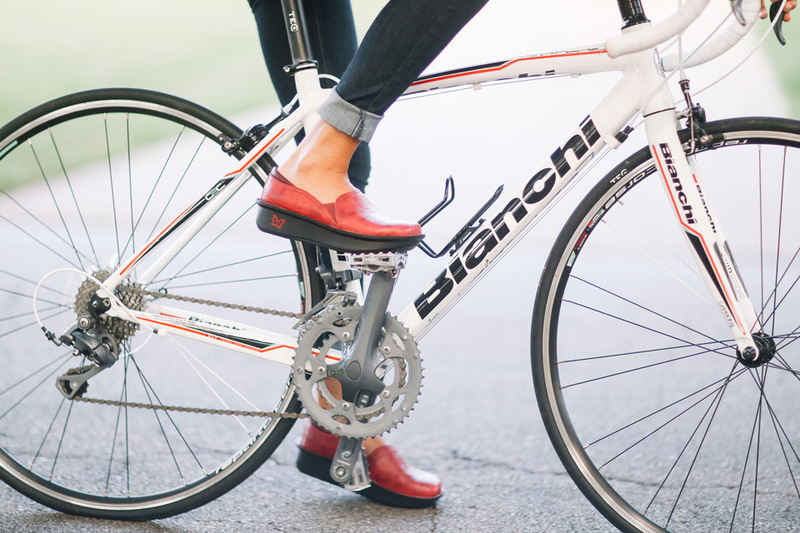 VERSATILITY: Need to ride your bike to work? Check! Toes and heels are safely covered in the Debra. Grinding out a 12 hour shift at the hospital and want shoes that not only look amazing with your scrubs, but feel amazing too? Check! Heading to dinner with friends wearing skinny jeans and your favorite button down? Check! I Heart U Red is versatile. It makes changing from day to night easy and effortless. Who doesn’t need some of that in their life?! The Alegria Shoes Fall 2016 Collection is arriving each week with so many other cute prints like the Classic Teal Tooled, Glee Monarch, Paloma Winter Garden, and more. Explore the new crop of shoes at www.alegriashoeshop.com and click on Fall 2016. Are you ready for BOOT season? It may still feel like it's 100 degrees outside, but the end of summer is in sight! August is upon us bringing a few cooler nights, Back to School buzz, and a penchant to transition our summer wardrobe into fall. 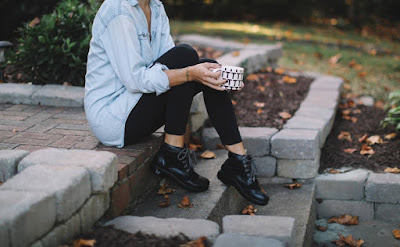 There is no better way to make this transition than with your favorite boots....Booties to be exact! Alegria has what's trending and we have them on SALE! 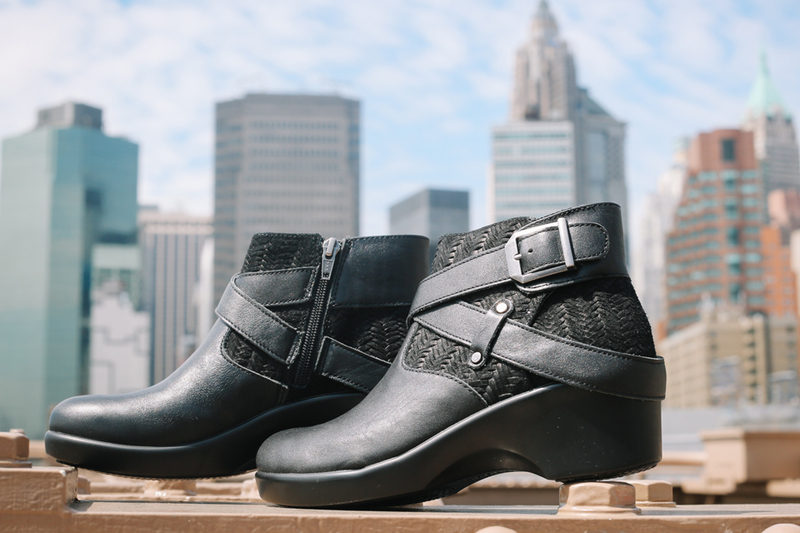 What makes Booties the perfect go-to shoe for transitioning your wardrobe from summer to fall? Well for starters they are short enough to show off your legs while still giving that awesome rustic, fall outdoor flair you crave. Try pairing the Alegria Eva with your favorite little black dress or leggings this weekend. 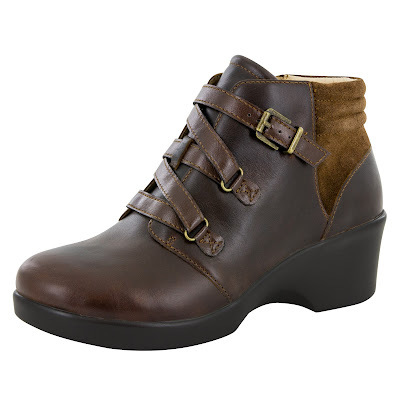 Another favorite for transitioning into fall is the classy and oh so frilly Alegria Hannah boot. Pair the Hannah with leggings or jeans to instantly upgrade the look. For a more casual look try the Alegria Ever. Pair the Black Embossed Paisley with a sassy little denim skirt or match with your casual business attire for Friday at the office! 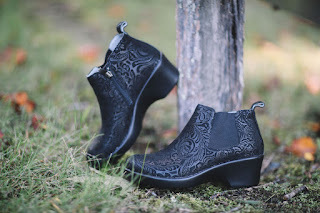 Transitioning your wardrobe this season will be fun and on trend with Booties from Alegria Shoe Shop! What do you think? 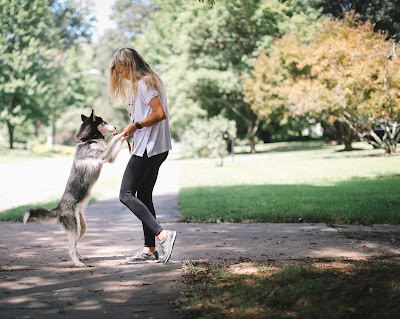 Share your ideas on transitioning your wardrobe this summer in the comments below or show us how you style your Alegria Booties on Instagram using #alegriabooties. Alegria Shoe Shop has new markdowns going on now!